Last fall, my husband and I spent a weekend in Maine with some very dear friends and members of their family. It was a mix and match kind of weekend with people coming and going for cocktails and meals which always makes things fun. On the night of our arrival, our hostess was also driving up from Boston so she picked up one of her favorite quick eats from Whole Foods that we could throw on the grill. They were the most scrumptious lamb koftas, filled with aromatic spices and reminiscent of the flavor profiles of my youth. 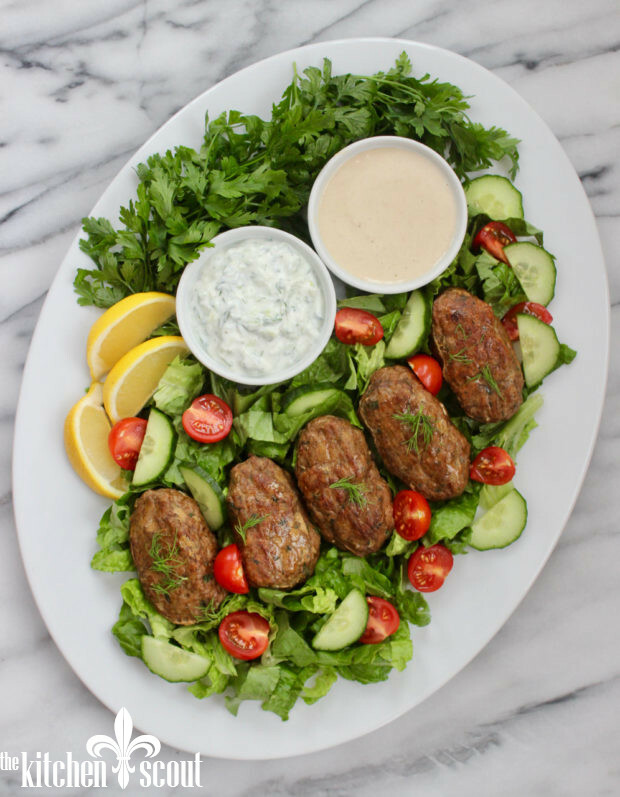 Koftas or as we call them in Armenian, Luleh Kebabs are traditionally made with ground lamb that is mixed with some onion, parsley and lots of earthy spices. According to one of my Armenian cookbooks, the word luleh means rolled. As such, the meat is formed or rolled into sausage shaped logs that are usually put on a skewer and grilled over an open flame. I came home a tad obsessed with finding these Whole Foods wonders on my own. I must have tried so many locations and never found them, at least in the short term. In my experience, they are not always available and certain locations carry them more regularly. I set out to recreate these Luleh Kebabs in my own kitchen as thankfully my husband also loves all flavors associated with Middle Eastern food. I searched around for recipes but wasn’t finding exactly what I wanted. In the end, I turned to our Kolligian family cookbook that my cousin, Joan compiled long ago that is filled with recipes from a variety of generations and includes stories that make me chuckle every time I read them. Turns out that Joan and her mother, Elizabeth (who you might remember from Aunt Elizabeth’s Fresh Apple Cake) had a recipe for the Luleh Kebabs in the book which I had not remembered! I was so excited. Their version mixes the traditional lamb with a touch of onion, some fresh parsley and a number of spices including paprika, coriander and one of my favorites, allspice. The allspice is the key as it lends a sweetness but also a warmth to the seasoning mix. We also use allspice in our traditional kufta recipes and it really takes me right back to my childhood. The only tweaks I made to their recipe was to add some garlic powder and a touch more parsley, and eliminate breadcrumbs. I made them and they were amazing. I wasn’t completely surprised as I have always loved any recipe from these two wonderful cooks. As for sharing the recipe on the blog, I am finding that more and more people are shying away from beef, lamb and even pork these days. So, I wanted to try them with turkey because I figured that might be more broadly appealing to my readers. The good news is that they are equally delicious. Well, speaking as an Armenian girl I have to say that I love the lamb, but the turkey was fantastic too and my husband gobbled up most of the first batch. We had some of the second batch for dinner last night. It’s important to use ground turkey, and not ground turkey breast which will completely dry out and you will be very mad at me. A couple of notes on preparing the kebabs and cooking them off. As with all ground meat preparations, it is extremely helpful to dampen your hands so that the meat doesn’t stick. I portion out the meat into roughly 3.5 ounce portions to get 10 kebabs. I use my Salter digital kitchen scale to do this. As a side note, I love having this kitchen scale. It comes in handy for so many things. After dividing the mixture into portions, I roll the meat between my two hands into a large meatball of sorts to bring it all together and then roll again to form the log. I find this to be the most efficient way, but you can do it however you wish! I dampen my hands before I make each kebab as well. If you prefer, you can shape them into burgers if that is easier. As for cooking, they are traditionally grilled or broiled for about 10-12 minutes total (with turkey you especially want it to cook through). I also baked the kebabs in a 350 oven for 20-25 minutes, flipping them once and then ran them under the broiler for just a couple of minutes to brown. I liked the texture of the baked kebabs the best. You can cook them in whatever way is most comfortable and easiest for you! I serve these with both a tahini sauce and a tzatziki sauce, but you could eat them as is, or just with a dollop of yogurt alongside. A squeeze of lemon is always nice to brighten the flavors. You can serve them hot or at room temperature. I hear there is a football game or two this weekend? You could even make the mixture into mini meatballs to serve as a snack. Enjoy! Luleh kebabs are traditionally made with lamb, but the recipe works equally well with ground turkey (not ground turkey breast which will dry out). 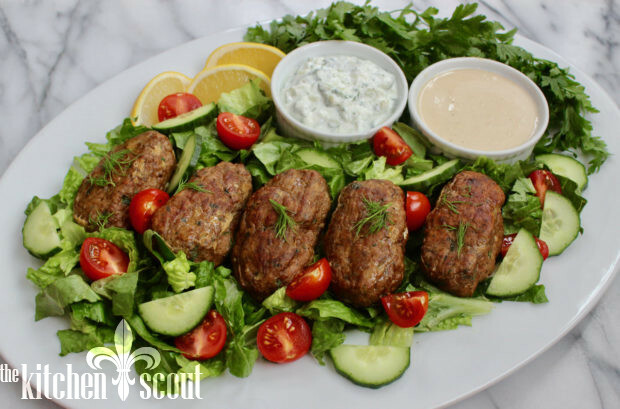 They are filled with warm and aromatic seasonings, giving these kebabs that distinctive Middle Eastern flavor profile that I love. Serve with a few dipping sauces alongside. Thanks to my cousin Joan and Aunt Elizabeth! In a large bowl, mix together the onion, parsley, whisked egg and spices until combined. Add the turkey or lamb and knead the mixture until all of the ingredients are completely blended and smooth. Divide the meat into 10 equal portions. Dampen your hands. It's important to do this before you roll each kebab so that the meat doesn't stick to your hands. My way of preparing the kebabs is to roll the meat into a meatball shape and then roll it again between the palms of my hands into a sausage shaped log that is roughly 1 inch by 3-4 inches in length. 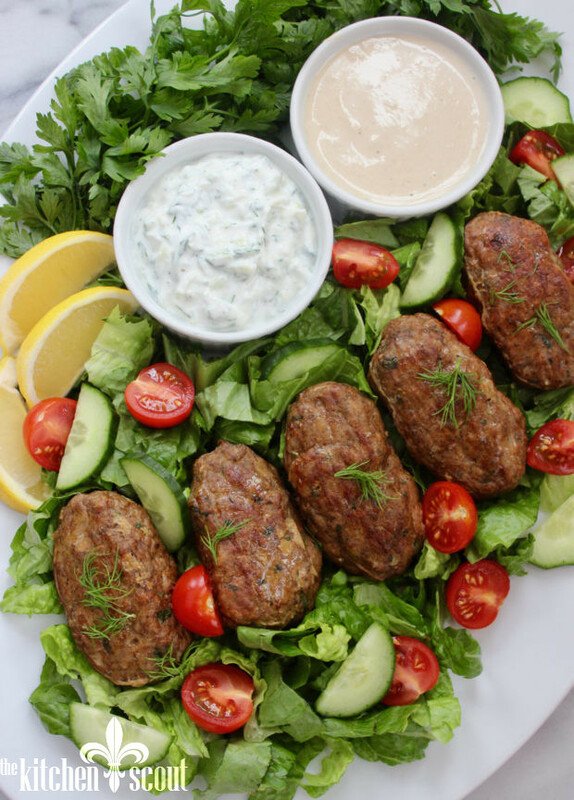 You can form the kebabs a day in advance and keep them tightly wrapped in the refrigerator. Remove from the fridge about 1/2 hour before you are ready to cook them to take the chill off. Cooking method one: Preheat the oven to 350 degrees. Place the kebabs on a foil lined baking sheet and bake them for 20-25 minutes, turning once. Finish by placing the kebabs under the broiler for just a few minutes to brown. Cooking method two: Heat the broiler. Place kebabs on a rack in a shallow pan and broil, turning frequently until browned on all sides and cooked through (about 10-12 minutes total). You can also grill the kebabs by inserting a metal or a soaked wooden skewer into the rolled kebabs and grilling over direct heat. Our daughter in laws family is Armenian and they made us luleh kebabs last night as an appetizer, and the flavors and texture of the meat was wonderful. We strongly favor lean chicken and turkey for health reasons. I’m going to give this recepie a try and realize the 99% fat free ground turkey we normally eat won’t inwork. Can you share with me the percentage of fat in the turkey used in this recepie? Thanks in advance for sharing! Made the Luleh Kabobs today for Paul’s “Book Group”; they read Red Sparrow, which has recipes at the end of each chapter, and decided that they would all bring one of the dishes to our house for the discussion. Chapter 7 ends with Tarik’s Adana Kabob. I made your recipe with lamb, and added 1/2 of a red pepper to the mixture to approximate the recipe in the book. I also made tzatziki sauce with mint for dipping the kabobs….all super easy (yay for food processors) and the dish received rave reviews. On another note…made the lamb ragu again last week (now a major Paul favorite); there’s always a lot left over since it’s just the two of us, so this time I added 2 cups of cooked rice to the ragu and then used that mixture to make stuffed orange peppers. Fabulous. Oops! I forgot: when I turned the ragu into pepper stuffing, in addition to the rice I also added about a cup of ricotta cheese. Yummy. new things as well! Love that! Looks delicious! I’m going to try these! Let me know if you like them, Ani! These sound delicious! My family LOVES the luleh lamb kebabs from the Armenian cookbook you gave me years ago and I definitely am going to try this version with turkey. I love coriander and am curious to try the allspice. Thanks Val! I hope you enjoy them, Francine! can’t wait to try these, Val!